Rev. Dean Brackley, S.J., is a professor of theology at the University of Central America (UCA) in San Salvador, and in 2010 he held the Rev. Francis C. Wade, S.J., Chair at Marquette University. Father Brackley entered the Society of Jesus in 1964 and was ordained a priest in 1976. He earned a doctoral degree in Religious Social Ethics from the University of Chicago Divinity School in 1980, and has traveled a vocational path marked by spiritual creativity, moral courage, and an unfailing companionship with the poor. Father Brackley’s early life in ministry was spent as a community organizer on Manhattan’s Lower East Side and in the South Bronx, exposing him to the eroding conditions of poverty and violence. As a faculty member at Fordham University he was known for his profound impact on the lives of students and for scholarly pursuits that brought theological and spiritual questions into deep engagement with the concerns of the real world. It was this commitment to the human and social implications of the Gospel that brought Father Brackley to the most significant decision of his life. When six Jesuit priests, their housekeeper, and her daughter were massacred at the University of Central America in San Salvador in 1989, Father Brackley quietly and heroically volunteered to take the place of one of the martyred Jesuits. Responding to the exhortation of Christ to “lay down one’s life for one’s friends,” he would thereafter never leave the side of the Salvadoran people on a permanent basis. 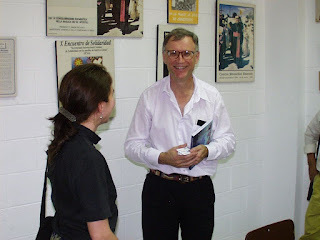 Serving at Universidad Centroamericana since 1990, Father Brackley has overseen the School for Religious Education, spearheaded pastoral outreach programs, and established new scholarships for students who go on to serve in parishes and faith communities throughout the country. Father Brackley has never failed to balance his demanding academic and administrative responsibilities with the personal and pastoral care of God’s people. He remains a compassionate and priestly presence to residents of a poor urban community in San Salvador. During his years of service at UCA, Father Brackley has hosted thousands of students and faculty members from North American Jesuit universities who come to El Salvador in order to honor, understand, and connect their lives to the sacrifice of the Jesuit martyrs. As an American whose life gives witness to deep and intentional solidarity with the poor, his ministry has grown to include the teaching and pastoral care of these pilgrims, acting as a bridge between the familiarity of their university lives in the United States and the joy amid suffering that they experience in the Salvadoran people. He holds their holy confusion with reverence, helping the visitors understand that, in Christ, there is no “other.” In all of his work, he brings the voice of the voiceless to bear on important issues. Father Brackley is the author of numerous articles and two books, The Call to Discernment in Troubled Times: New Perspectives on the Transformative Wisdom of Ignatius of Loyola and Divine Revolution: Salvation and Liberation in Catholic Thought. His books, articles, and public lectures are important contributions to the canon of Christian spiritual writers. At a Christmas Eve address shortly before his death, Archbishop Oscar Romero of El Salvador encouraged the faithful to live in such a way that, “We are never ashamed of saying, ‘The Church of the Poor.’” Indeed Father Dean Brackley is never ashamed. Rather it is in the poor that he finds the fullness of his vocation as a priest, intellectual, and advocate. It is in the poor that he recognizes – and helps others recognize – the face of Christ. Because his life exemplifies the very heart of Marquette University’s mission, Reverend President, I hereby recommend Father Dean Brackley of the Society of Jesus for the Marquette University degree of Doctor of Religious Studies, honoris causa. I met Dean on several occasions...he was truly a gentleman and a scholar. He will be missed! I am among the lucky ones who counted Dean a friend. We met shortly after he arrived in El Salvador as one of the replacements for the six Jesuits who were murdered by the army in November 1989. Many volunteered to come to the UCA in the wake of that atrocity; Dean was among the chosen. Especially in the early 1990s, during the transition from war to peace, we had many coversations both on and off campus. His political sense was as acute as his theological clarity; he was always one of the first people I called during visits to El Salvador and he was unfailingly generous with his time and insights. I can add little to the Marquette University citation, except to say that he will be sorely missed. Pacem en Paz. Dean was very committed to the Salvadoran people and their struggle. He also loved the country and Salvadorans deeply. I always enjoyed my taking delegations to the UCA to meet with him when I lived in El Salvador the the late 1990s.